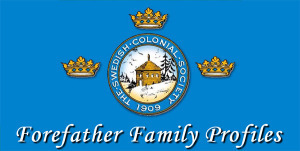 For the first time in the 107 year history of the Swedish Colonial Society’s history, we are pleased to announce that the SCS Council has approved ADDITIONAL certifications for those Forefather members who can prove lineage to more that one Forefather. Each additional Forefather application must be completed in full and include the full Forefather Application FEE. There could be a delay in processing for approval as first time Forefather applications will take priority. To start the process, you can contact the Swedish Colonial Society Registrar at Registrar@ColonialSwedes.net. We will provide additional information in the upcoming weeks.